Election season can lead to the creation of much hype around even the smallest of subjects. And more so when it is the question of the leading candidate giving a live televised interview, that too answering questions put forward by the public itself. Thus, when NDTV began its ad campaign to publicise Candidates 2014, a town-hall style question & answer show organized by Facebook for the major leaders for the Lok Sabha Elections to be held in a couple of months, there was bound to be some buzz among the public, especially given the presence of Narendra Modi in the itinerary. This was supposed to be Modi’s first interview as BJP’s official prime ministerial candidate, and the fact that people were being given the opportunity to put forward their questions for contention was much more than just an icing on the cake. There were over two thousand questions asked solely for. Mr. Modi, and an anticipating public waited for the third of March, the day the session was to be telecast live. At virtually the eleventh hour arrived what some had been anticipating, while some weren’t prepared for at all- Narendra Modi decided to opt out. Had the interview been with a representative of and facing questions decided by a particular channel and/or website, the boycott would still have been understandable. But here, the channel and the interviewer were only acting as media for the questions posed and posted by Indians online, which were also available openly to the public. It is very possible that Mr. Modi had a peek at the kinds of questions that would possibly have been asked, and instead of preparing his own cheat sheet, decided not to face them altogether. There must have been hoards of ‘I told you so’s and more dismal faces- but Modi’s opting out certainly wasn’t very surprising, especially after the Rahul Gandhi interview fiasco. While soliloquy and mass oratory isn’t everyone’s cup of tea, so isn’t responding to direct questions, especially for as controversial a personality as Modi. One can very certainly imagine the type of questions that could have been asked, and the type of answers Mr. Modi would have given, but imagination is all that remains now. This event has the potential of becoming a major election issue if tapped well, and only as much of a drub is covered so. For now, Mr. Modi’s only real forte seems to be monologues and sermons (though he does them pretty well), but for a leader who seems to have a national appeal as of now, was answering the people’s questions so challenging that he has had to opt out? 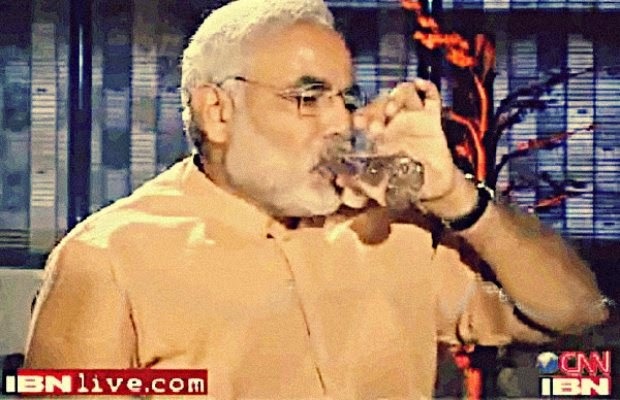 Modi has certainly not been known for his interviews-he has given few after 2002, including one he walked out of within two minutes- but if someone like Rahul Gandhi can give one-albeit a bit too (em)power(ment)ful- Modi, who has openly denounced the shehzaada, should have stepped up to one himself. Moreover, the people of the country deserve to know his views on the issues they choose, not the ones he wills to sermonise on. We will leave you with this old interview of Narendra Modi, when CNN-IBN had somehow managed to get Mr Modi into their studio.